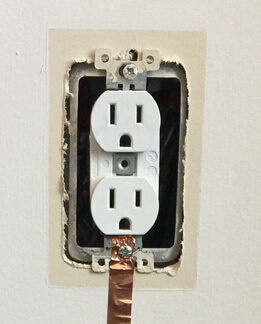 Turn off power to Outlet, remove faceplate cover, remove bottom screw holding outlet to conduit box, start the 1/2 wide adhesive backed copper foil tape as shown, place screw through copper, replace ac face plate cover, restore power. Run ground foil down wall and onto substrate about a foot or 2. Hint: Use an L square to keep it parallel or it may bother you long term! It's fine to attach to multiple outlets. This same method may be used to attach to steel structural support columns as well. Test your grid as you go. 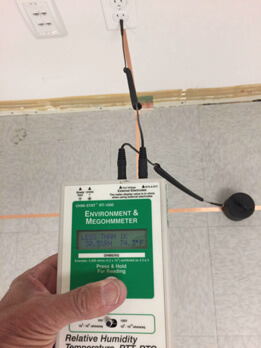 The resistance to AC electrical should be less than One k ohm if using a megger. If using a standard volt ohm meter the readings are normally less than a few ohms. 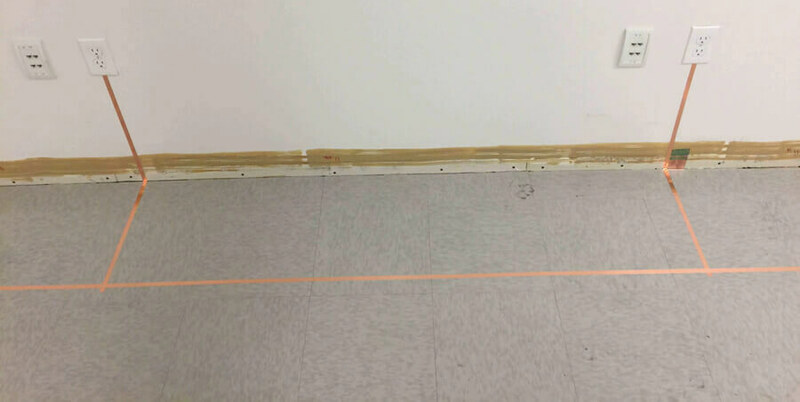 Method of operation: A Copper strip is placed over the ground strips coming down from the outlet (or steel structural support columns) and is run the full length of one wall. When the tiles are placed over the copper strip running parallel with the wall the entire structure becomes grounded. ElectraLock and ElectraTough have excellent tile to tile conductivity but the use of additional copper provides an extra layer of assurance in the ground system. 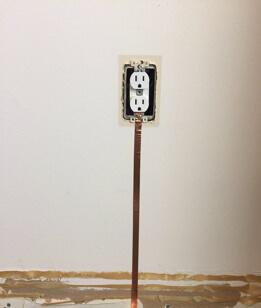 Some clients prefer to install a strip of copper around the entire perimeter of the installation area (about 4" from each wall). This "full perimeter ground" is tied into the strips running up the walls to the outlet. The continuity of the copper strips may be enhanced by center punching where the strips overlap (thus driving the copper through the adhesive to the strip beneath).